Town Square has many places of where to eat. After walking around, we decided to eat at California Pizza Kitchen. It was my first time eating at CPK, and as I was looking at the menu, I was surprised with the types of pizzas they made. No pizza was ordinary like the Cheeseburger Pizza, Pear & Gorgonzola, Jamaican Jerk Chicken, and etc. I was willing to try anything and ate Jessica's favorite dishes, Chicken Picatta - chicken breast in a creamy lemon-caper sauce with spaghettini pasta and Wild Mushroom Pizza - Cremini, Portobello, Shiitake, and white mushrooms, Fontina and Mozzarella cheeses with a wild mushroom walnut pesto garnished with chopped Italian parsley. 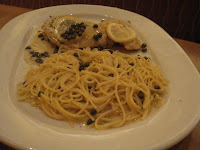 I enjoyed the lemon-caper sauce on the Chicken Picatta (I love lemony foods!) 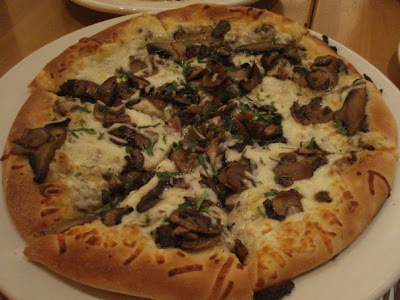 and liked how there was a lot of mushrooms in the Wild Mushroom Pizza and the crust was the best! I know I'm going back to CPK just to try out their other pizzas!